Here’s another healthy breakfast recipe that you must try. Again, they are from Peanut Butter Fingers blog, and they’re a big-time winner! 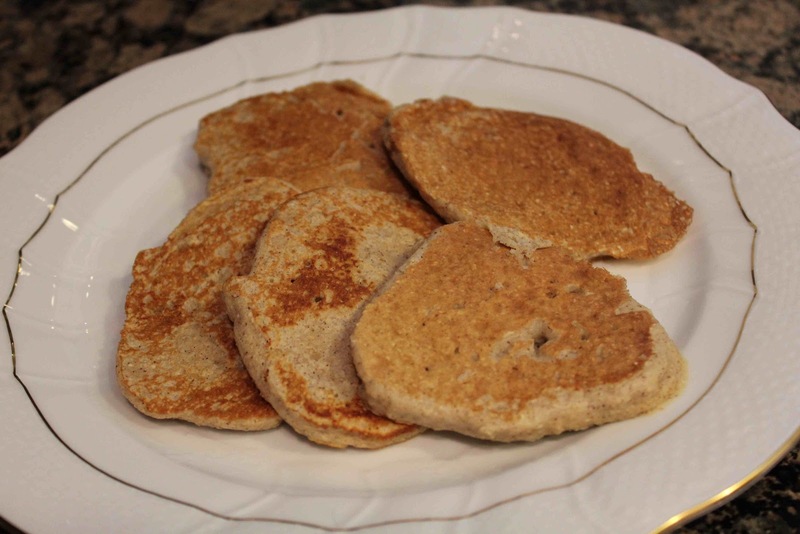 These pancakes are nearly identical to the healthy protein pancakes I’ve made before. The only difference…. these have a mashed banana, which I am a huge fan of! As far as nutrition, this recipe is just about as healthy as you can get! Great for diabetics, like my uncle Bobby, these have no added sugar. Rolled oats provide for a source of whole grains, egg whites are 0g of fat & 17 calories each, cottage cheese packs 15g of protein per 1/2 cup serving, and the banana is your source of fruit! I like to top these pancakes with 2 teaspoons of pure maple syrup, which from my calculations, is only 35 calories. Finish them off with a handful of raspberries, and you’ve got a colorful, delicious and extremely healthy breakfast. 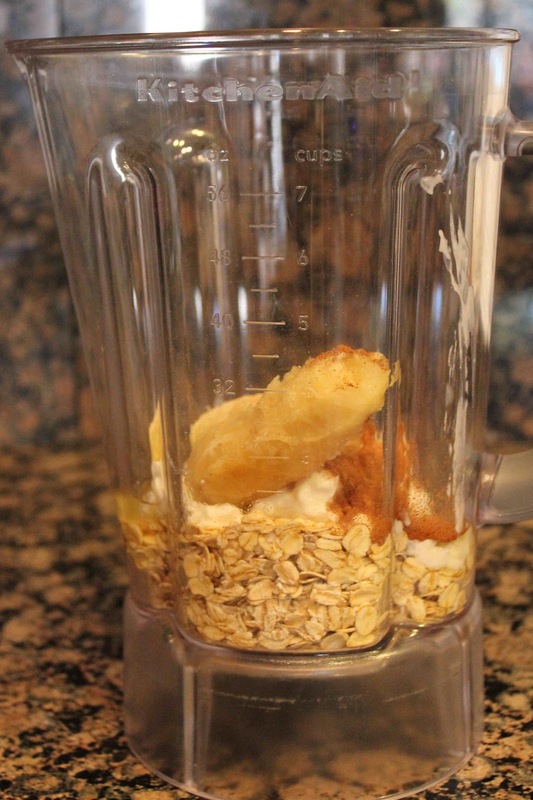 Blend all ingredients in blender until batter is smooth. 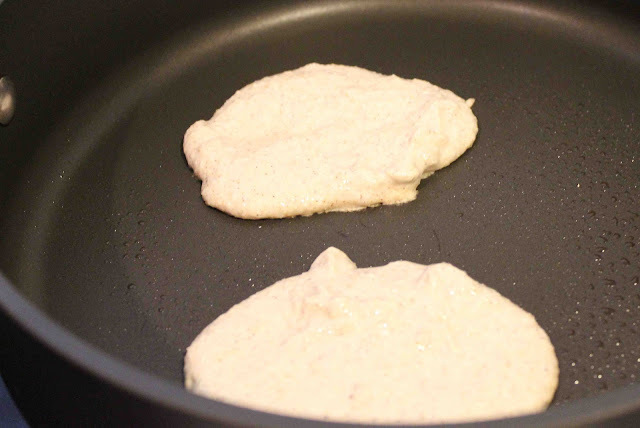 Pour batter into warm pan and cook for 3 minutes, or until edges start to harden. Flip and cook for 2 more minutes. 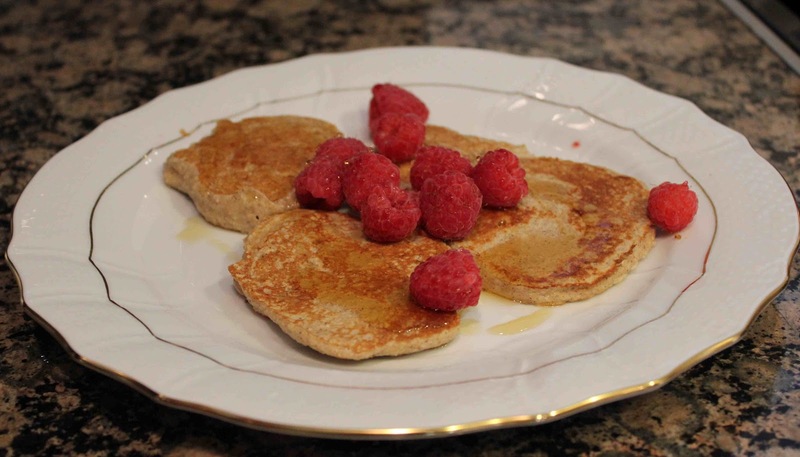 Drizzle with 2 teaspoons of maple syrup and a handful of raspberries. 1. Spray pan with cooking spray and heat to medium heat. 2. Combine all ingredients in a small bowl and blend with an immersion blender (or blend in a food processor) until batter is thick, relatively smooth and all ingredients are fully mixed. 3. Pour batter onto warm pan to form six medium-sized pancakes. 4. Allow to cook until edges start to harden, about 3 minutes. 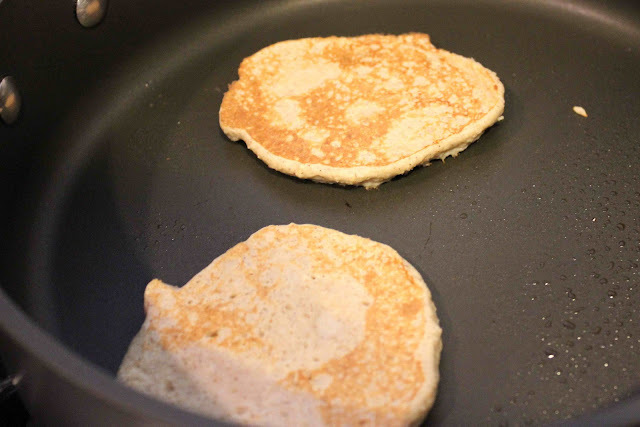 Flip pancakes and cook for approximately 2 more minutes. 5. 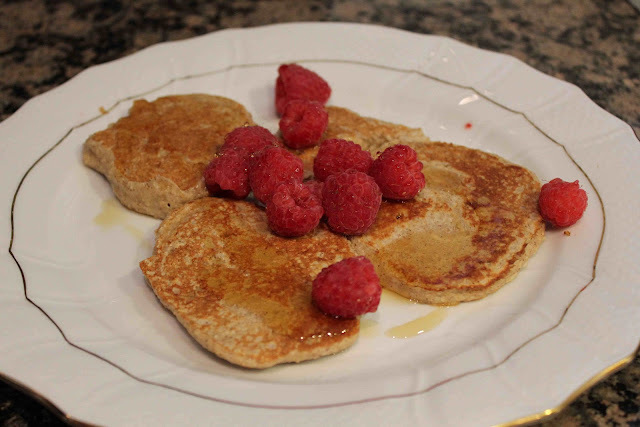 Top with 2 teaspoons of pure maple syrup and a handful of raspberries and enjoy. Yield: 1-2 servings, depending on how much you eat! One Response to "Banana Protein Pancakes"